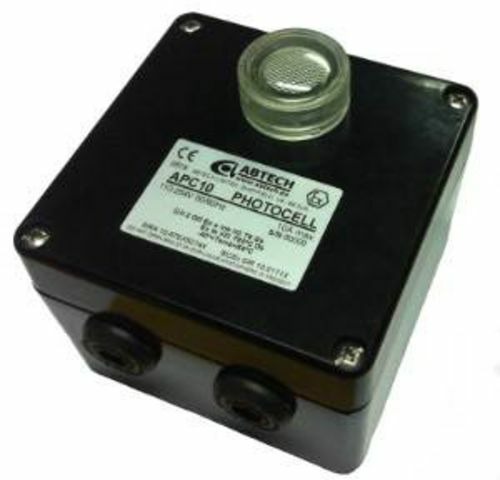 The Abtech APC photocell offers the user the ability to control the switching of lighting heavy industrial areas, without the need for major rewiring of existing circuits. Help reduce carbon emmissions and running costs by switching off unwanted lighting automatically when a desired lux level is reached. Based on Abtech&apos;s proven BPG enclosure range APC photocell combines tried and tested circuitry with superior ingress and UV protection. The standard switching level is 70 lux, with an on/off ration of 1:1. There is also a built in delay of 25 seconds to prevent nuisance switching. Other lighting levels are available to special order. The unit is ingress protected to IP66/67 according to EN60529.